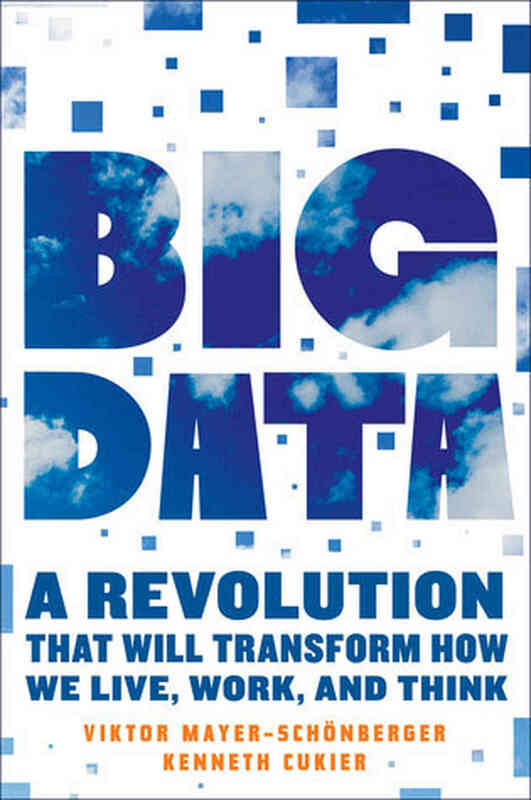 Big Data: A Revolution that Will Transform How We Live, Work, and Think | What's The Big Data? The most important part of the book is the authors’ discussion of potential risks and possible ways to address them, providing a launch-pad to a much-needed conversation regarding what’s to be done about big data. In addition to privacy—Mayer-Schönberger and Cukier point out that perfect anonymization is impossible in the age of big data—they are concerned about two other, less-discussed, risks. One is what they call “propensity” or using big data predictions to punish people even before they acted. Incidentally, the day I spoke with Mayer-Schönberger and Cukier, Senator Rand Paul was questioning the right of the U.S government to target U.S. citizens with drones on American soil. As a Wall Street Journal editorial pointed out, the U.S. government could not have targeted Jane Fonda, as Paul hypothesized, but it can target an “enemy combatant” (including a U.S. citizen so designated) anywhere, including on U.S. soil. The possibility that our fascination with data may become a dangerous addiction is the third risk the authors of Big Data discuss, what they call “the dictatorship of data.” The potential for abuse of data by people with bad intentions and misuse by blindly admiring people with good intentions is as big as the data itself. As for propensity, the authors are categorical: “The predictive state is the nanny state, and then some.” The more we rely on data-driven interventions to reduce risks in society, they argue, the more we devalue the ideal of individual responsibility. To help with the monitoring and transparency required by big data, Mayer-Schönberger and Cukier suggest developing a new professional class that will be responsible inside and outside companies for the proper handling of data. “Just as the explosion of financial information got us to standardize on accountants,” Cukier told me, “we suggest the same sort of approach with [what we call] the ‘algorithmists’ of big data.” These new professionals will be experts in computer science, mathematics, and predictions and will be bound by a professional certification and a vow of impartiality and confidentiality. One of the many fascinating big data analysis examples recounted in the book is the story of how a crack team of young data scientists found a way to identify “Illegal conversion” in New York—the practice of cutting up a dwelling to many smaller units so that it can house as many as ten times the number of people it was designed for. The 200 inspectors on hand used to follow up on the 25,000 illegal-conversion complaints they get each year by focusing on the ones they deemed most important. But only in 13 percent of cases did they find conditions severe enough to warrant a vacate order. After the analysis of data collected by the city but never combined and analyzed, they were issuing vacate orders on more than 70 percent of the buildings they inspected. By indicating which buildings most needed their attention, big data analysis improved their efficiency fivefold. Our obsession with causality is reflected in the authors seeing causality where none exists. What has a problem of ranking, of deciding which complaint is of higher priority, to do with causality or asking why? Before the big data analysis, the inspectors also relied on correlations, such as the number of calls to the city’s “311” complaint line. It’s just that these correlations were misleading because of where they came from or what the complaint was about. The big data team simply uncovered better, more meaningful correlations. The authors correctly say, “For many everyday needs, knowing what not why is good enough.” The book is full of such examples from making better diagnostic decisions when caring for premature babies to which flavor Pop-Tarts to stock at the front of the Walmart store before a hurricane. Big data can help answer these questions, but they never required “knowing why.” Big data analysis can be about correlations OR causation—it all depends, as it has always been, on what question we are asking, what problem we are solving, and what goal we are trying to achieve. I don’t think big data will do anything to—and has little to do with—our obsession with causation. But as Big Data successfully demonstrates, this is one technology-driven phenomenon that can improve our lives and require all of us to pay attention and start engaging in a meaningful conversation of what to do about its potential risks. Cukier is probably right. But I would venture to speculate that the Splunk IPO (April 2012, one month before the Facebook IPO) is what will be viewed in the future as the defining moment, the launch of the big data era. What I’m certain about is that Big Data will be the defining text in the discussion for some time to come. This entry was posted in Big Data Analytics, Big Data Futures, Business Impact, Data Science, Data Scientists, Interviews, Privacy, Risks, Social benefits. Bookmark the permalink.